My 3 week absence from this learning log has been due to a wonderful holiday. The first 2 weeks was on a cruise I found through the Needlework Tours company and this included 3 x 2 day workshops. 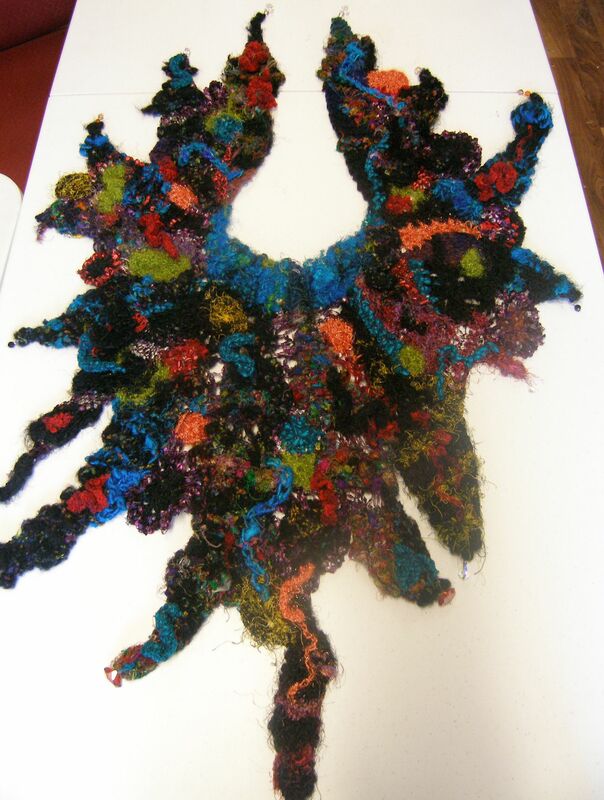 The first workshop I did was with Prudence Mapstone who is internationally known for her freeform fibre art. 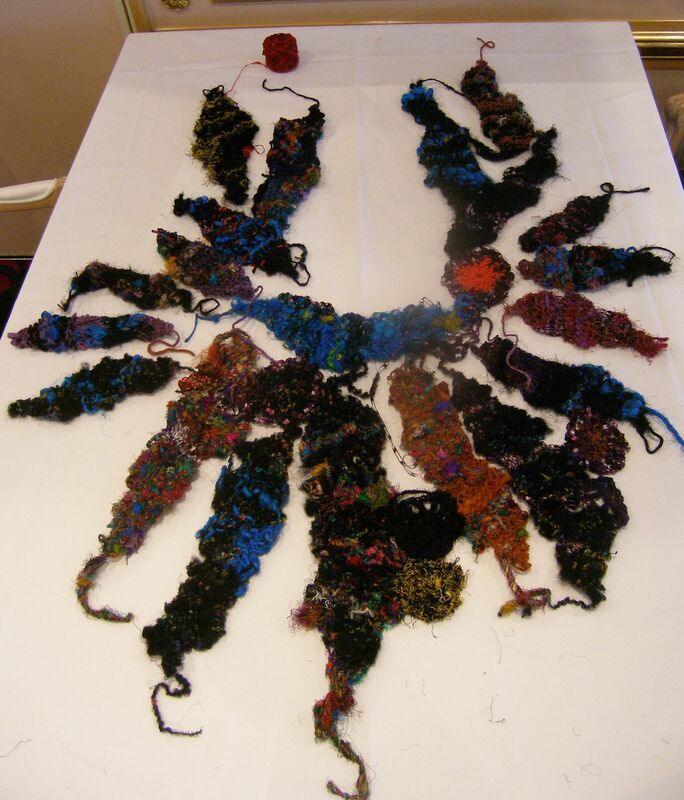 Prudence taught a workshop on basic freeform knitting and crochet to produce a shawl. Wools and fancy yarns in different colours were available to choose from so each student could select their own colourway. 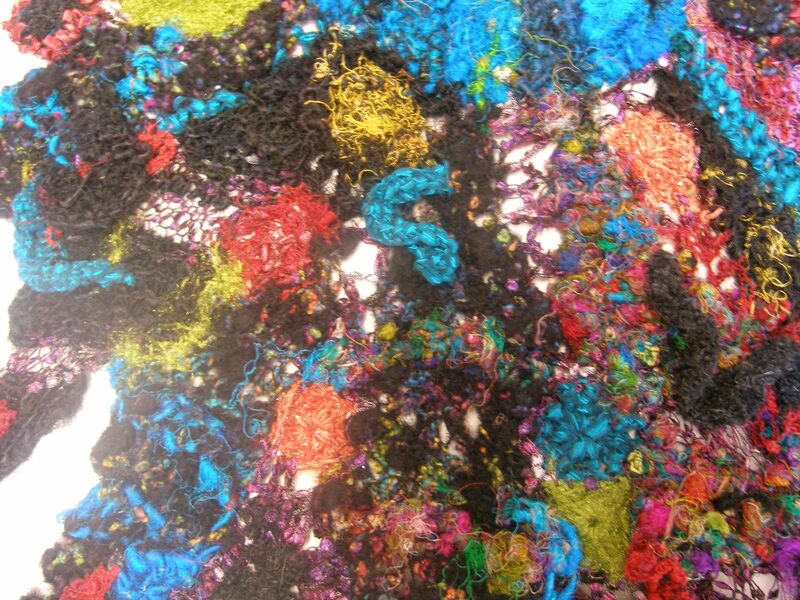 I chose to base my shawl on black with splashes of bright colour to make the design “pop”. As I haven’t knitted for 30 years and have never crocheted I had a crash course in the basics of both from my mother in the 2 weeks before the workshop and fortunately I was in a group (of 15) which included some ladies with many years experience in both. 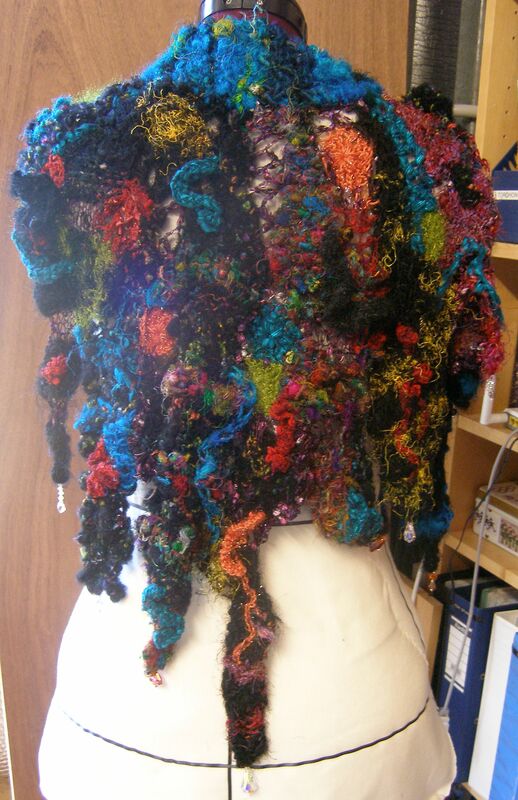 There was no pattern for the shawl, the principle behind freeform is that you make up the shapes as you proceed, combing colours, techniques and yarns to produce highly individual and variable results. To start with we were given basic instructions to make a leaf shaped piece in just knitting. After that we discarded the instructions and instead followed our own instinct to produce more shapes, each one vaguely leaf shaped but changing to include crochet, holes, varying thicknesses of yarn and different colours. Once the basic shapes were created we added small sections of crochet to the outer edges. During the 2 days (and with a lot of extra work in the evenings and the day off inbetween) I was able to produce a number of leaf shaped pieces which I laid out in a rough shawl shape. I used my heaviest piece, in thick turquoise wool, as the back neck piece which would then support the weight of the other pieces. The next step (after the workshop was over) was to make a number of crocheted circles in different sizes which could be used as fillers, and to start joining the pieces together. I discarded a couple of my leaves as I felt the colours did not fit in the overall scheme, and started joining the others together. Joining was done mostly with an open yarn and using crochet as this enable different shaped gaps between leaves to be filled easily. The crocheted circles were added into larger spaces and some smaller ones made as well. The trick was to get the colours right, particularly the bright patches of orange and green as I wanted the whole design to be balanced without each side matching. 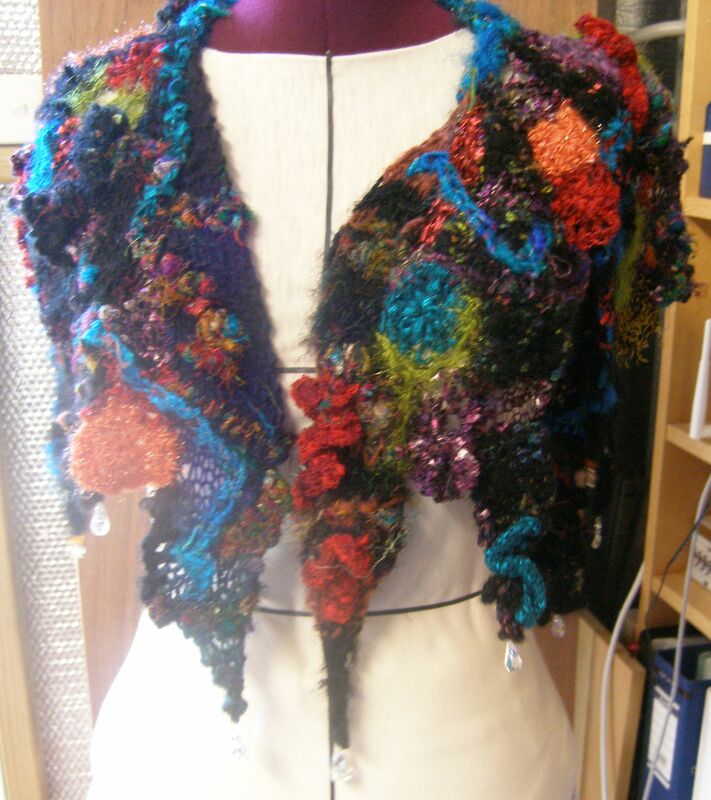 I also added surface crochet chains and knitted ruffles on the surface either where extra colour was needed or in some cases to break up an area of colour that was too consistent. 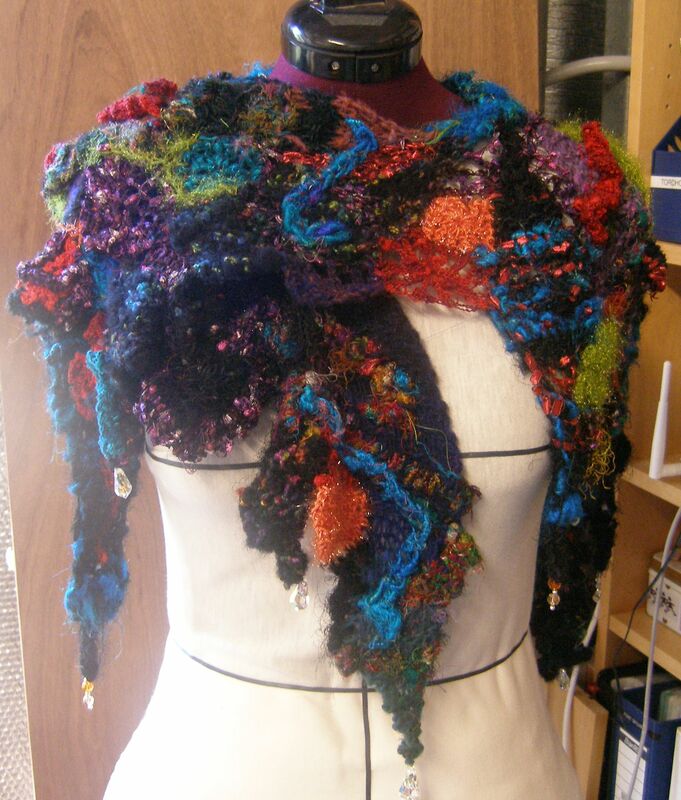 The finishing touch was the addition of crystals to the ends of the shawl to add weight and help it to hang nicely. The above close up shows some of the different inclusions – leaves, crochet circles, joining stitches, surface crochet chain stitch and knitted ruffles. With the amount of detail it is hard to pick the individual leaves out of the finished shawl. The following photos show the finished shawl as it is mean to be worn. I really enjoyed this workshop and learning the new technique; I particularly liked the individuality of freeform and being able to create a completely unique fabric.